The American School of Puerto Vallarta would like to invite you to attend our Third Annual Art Auction! This year’s event will take place on Wednesday, February 17th, 2016 in the Astor Ballroom of the St. Regis Punta Mita Resort. The Auction will feature works from international artists, among them three mothers and seven students from our school. Tickets are $25 USD per person and includes cocktail and appetizers at 6:00 and a bidding pallet and catalog for the auction, set for 7:00 pm. Seating is limited. Please stop by the school’s cashier in Marina Vallarta to purchase your tickets. 50% of proceeds after expenses will be destined to school improvements; last year they helped build the new art classroom. View the art selection on our online catalogue. 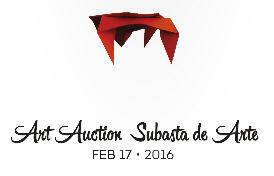 For more information, please email artauctionmexico@gmail.com or telephone (322) 188-7747. The St. Regis Punta Mita Resort is located at Carretera Federal La Cruz de Huanacaxtle - Punta de Mita Km.19.5, Riviera Nayarit.